​Extent: Country southwest of Petersburg and west of Weldon Railroad. Scale 4 inches = 1 mile; 15 inches west to east; 12 inches north to south. Fort Wadsworth, Fort Duchesne, and Globe Tavern in the east, Rebel works near Dr. Boisseau house in northwest corner, “Old Rebel works” crossing Squirrel Level Road in southwest corner near Hawks and Smith houses. 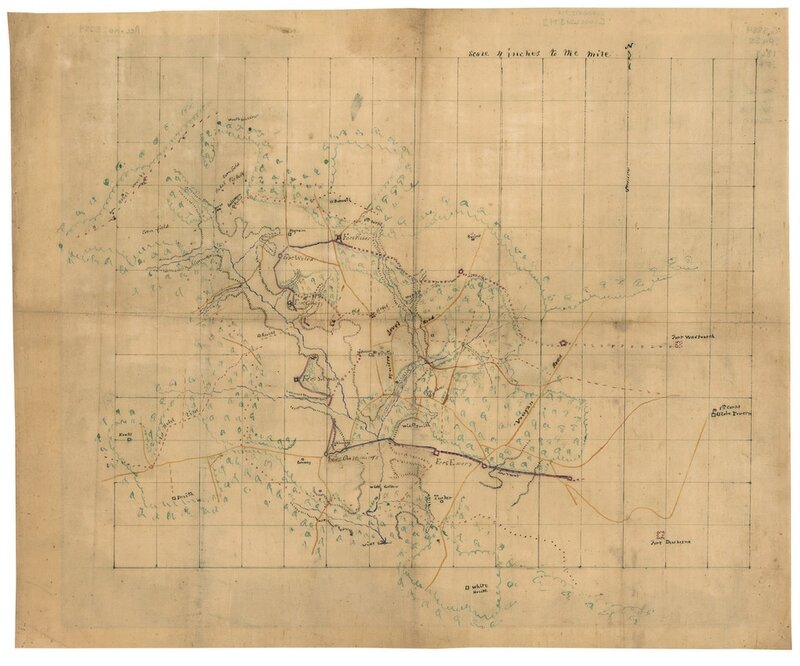 Description: Map is drawn on a one-inch grid and is likely an enlargement from another map. Main roads, farm roads, streams, swamps, woods are shown. Houses are labeled by residents. This version does not include the elevation hachures added on LVA192. Globe Tavern labeled HQ 5th Corps. Peebles labeled HQ 9th Corps. 9th Corps lines are emphasized and extend from what would be Fort Fisher (shown as a square redoubt), west to Fort Welch, south to what would later be called Fort Cummings, east to what would be Fort Clark. 5th Corps lines are drawn with dashes and extend from Fort Fisher back to Fort Wadsworth. None of the forts on the “fishhook” are named. Pegram and Boisseau houses shown as “ruins.” Poplar Spring Church shown as “ruin.” US picket line is shown as a series of red dots extending south of the Boswell house and directly past the Boisseau house. Opposing “Rebel pickets” shown with blue dots. Small x’s evidently show the locations of artillery pieces in various batteries. Observations: This map was drawn quickly but fairly accurately to depict the deployment of the 9th Corps relative to the 5th Corps. Drawn after the “fishhook” line was entrenched and tied back into the Weldon Railroad lines at Fort Clark. Likely drawn before any of the new forts were officially named. 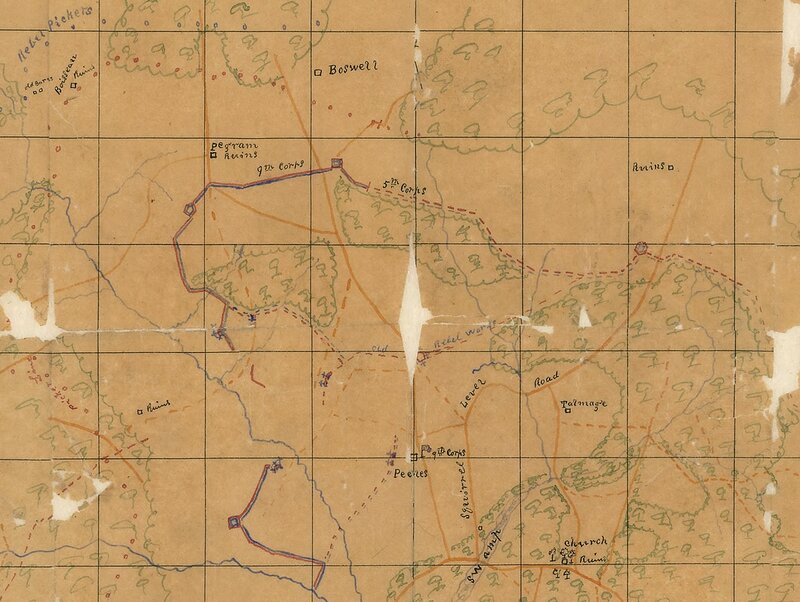 Likely a 9th Corps map. Fortifications are accurately depicted. Labeling is rather amateurish; same hand as map lva00192. Woods are hastily filled in. Works were constructed during the week of October 5: “Two redoubts were constructed on the front line [Fisher and Welch], three on the flank [Gregg, Sampson, Cummings], and two on the rear line [Emory and Siebert], with strong infantry parapet connections and heavy slashing in front.” (Parke, ORA, vol. 42, I, 547) 9th Corps continued to occupy this position into November. 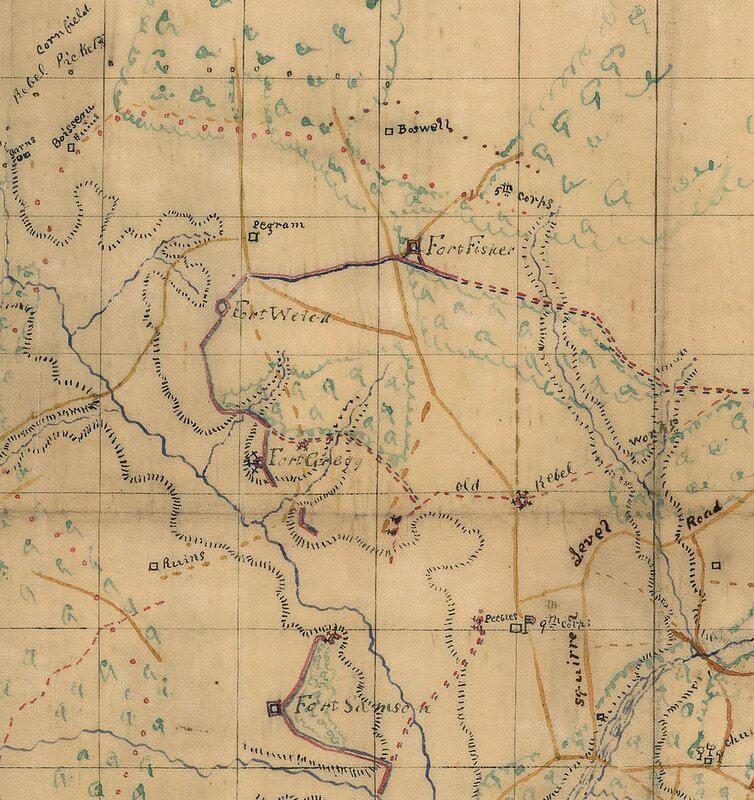 The 8-inch to the mile Michler-Weyss map shows the US picket line south of Dr. Boisseau. ​Extent: Country southwest of Petersburg and west of Weldon Railroad. Fort Wadsworth, Fort Duchesne, and Globe Tavern in the east, Rebel works near Dr. Boisseau house in northwest corner, “Old Rebel works” crossing Squirrel Level Road in southwest corner near Hawks and Smith houses. Scale 4 inches = 1 mile. 15 inches west to east; 12 inches north to south. 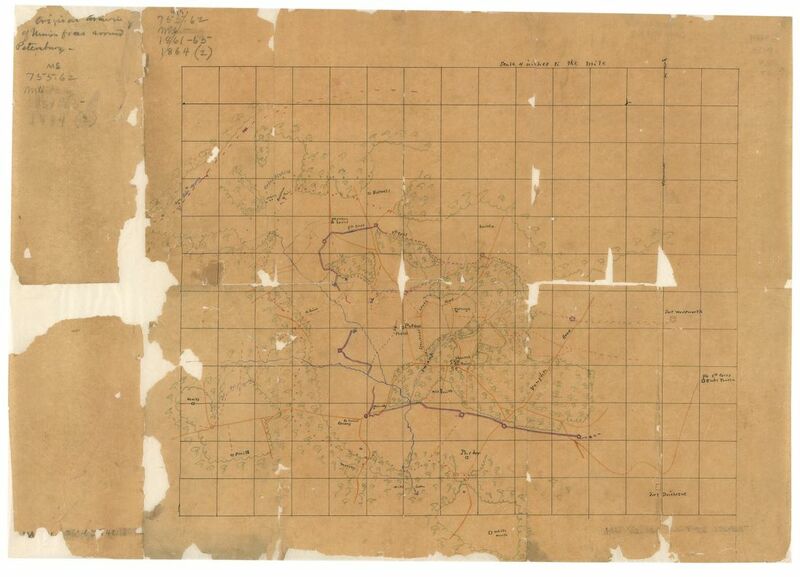 Description: Map is drawn on a one-inch grid and is likely an enlargement from another map. Main roads, farm roads, streams, swamps, woods are shown. Houses are labeled by residents. This version of the map includes some basic elevation hachures. Globe Tavern labeled HQ 5th Corps. Peebles labeled HQ 9th Corps. 9th Corps lines are emphasized and extend from what would be Fort Fisher (shown as a square redoubt), west to Fort Welch, south to what would later be called Fort Cummings, east to what would be Fort Clark. 5th Corps lines are drawn with dashes and extend from Fort Fisher back to Fort Wadsworth. Boisseau house labelled “ruins.” Poplar Spring Church labeled “chur.” US picket line is shown as a series of red dots extending south (then amended in a darker red ink to north) of the Boswell house and directly past the Boisseau house. Opposing “Rebel pickets” shown with blue dots. Small x’s evidently show the locations of artillery pieces in various batteries. Observations: Before it was officially named, Fort Welch was referred to as the “Pegram House Redoubt.” (ORA vol. 42, pt. 3, 297.) All forts on the “fishhook” are named, making this a later version of base map lva00193.